Matilda Jane Murdoch C.M. O.N.B. Name: Matilda Jane Murdoch C.M. O.N.B. Wishes: As an expression of sympathy, a donation may be made to the Saint Andrew’s Roman Catholic Church Cemetery Fund, The Miramichi Emergency Centre for Women 140 Ellen Street Miramichi, N.B. E1V 3M4, the Miramichi Food Bank 163 Henry Street Miramichi, N.B. E1V 2N6, Hospice Miramichi (www.hospicemiramichi.com) would be appreciated. Matilda Jane Murdoch C.M. O.N.B., 99, of Loggieville, N.B., passed away on Saturday February 2, 2019 at the Miramichi Senior Citizens Home. Born in Loggieville, N.B., the daughter of the late David & Ethel Rose (Burke) Kelly. Matilda is survived by her daughter; Mary Jane Kingston (Lawrence) of Loggieville, sons: Owen Murdoch (Mona) of Loggieville, Terrance Murdoch (Betty) of Graven Hurst, ON., Leo Murdoch (Eileen) of Newcastle, Nine grandchildren and twelve great-grandchildren. She is also survived by her sister Ethel Marie Hayes (late Holly) of Saint John, and several nieces and nephews. She is predeceased by her husband Francis J. Murdoch, two infant sons David and Joseph, sister; Lucretia (Bruce) Wilson, and Mae Girouard, brothers; James Kelly (Catherine), Burke (Patricia) Kelly and Keady Kelly. Matilda was a renowned fiddling legend whose musical influence and style has been studied and enjoyed around the world. She was a ground breaker for women in fiddle music, and paved the way for women fiddlers of today. She received numerous awards and accolades for her talent. She was a Member of the Order of Canada, the Order of New Brunswick, the North American Fiddle Hall of Fame and the New Brunswick Country Music Hall of Fame. She is the recipient of the Freeman of the City of Miramichi, the Senate 150th Anniversary Award, East Coast Music Awards” Stompin” Tom Connors Award for her Lifetime Achievement in Music, and Music New Brunswick's Lifetime Achievement Award and has been acknowledge it the "Who's Who of Canada" publication, just to name a few. She was very proud of where she came from and loved her community. She was a gifted composer, having written hundreds of her own compositions. Her music was born on the Miramichi, which inspired many of her tunes, several of which have Miramichi titles, the most famous being The Loggieville Two Step. 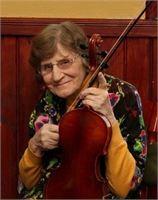 She was one of the founding members of the Miramichi Fiddlers Association, created to bring together new and seasoned musicians with a love of fiddle music. She was the heart of her family and her greatest joy came from being a mother, grandmother and great grandmother. She especially enjoyed hearing the accomplishments and activities of her grand and great grandchildren and loved them all very dearly. She was a strong, independent woman with a brilliant mind, a quick wit and an unassuming presence. She radiated pure peace and joy and people were drawn to her because of that. Her light shone brightly upon this world and we are truly blessed for having known her. Matilda Murdoch is resting at Maher’s Funeral Home Miramichi on Friday February 8, 2019 from 2-4 & 7-9. Funeral Mass will be celebrated on Saturday February 9, 2019 at St Andrew’s Roman Catholic Church at 11:00am with Fr. John Fraser officiating. As an expression of sympathy, a donation may be made to the St Andrew’s Cemetery Fund, The Miramichi Emergency Centre for Women 140 Ellen Street Miramichi, N.B. E1V 3M4, the Miramichi Food Bank 163 Henry Street Miramichi, N.B. E1V 2N6 or Hospice Miramichi (www.hospicemiramichi.com) would be appreciated would be appreciated.